"As above, so below" is a phrase often used by many in the occult community, but, I often wonder if some of those who use it, understand its significance. One often hears the explanation that entails man and woman are made in the image of God, or the microcosm is a reflection of the Macrocosm, and all that is contained in the Universe is also contained within the very nature of our being. These explanations often suffice to explain the general meaning of this common hermetic phrase, although there is a lot more to be discovered about its meaning if one will but delve a bit more deeply into the ancient texts.. The sacred writings of the ancient sages are what has come down to us as mythology and holy scripture, often the latter being a retelling of the former. For example, many of the New Testament stories have striking correlations with ancient Egyptian mythology. Gerald Massey lists over two hundred and seventy such similarities in the appendix of his excellent two volume book "Ancient Egypt The Light of The World" (pp907-914). Most of these myths have their origin in astronomical lore and the stories of these myths, as seen from an exoteric (outer) perspective, are explaining the movements of the celestial bodies such as certain star constellations, the planets, and the Sun and moon. The film Zeitgeist explains this principle very clearly in relation to the movements of the Sun with the story of Jesus' birth, death, and resurrection. See here http://video.google.com/videoplay?docid=1543831119879192379# But, the meaning of these stories do not end solely with this type of interpretation; there are deeper spiritual meanings which we shall take a look at shortly. There are other examples in Revelation 3:12 and 21:2 where it makes mention of a new Jerusalem that comes down from out of heaven. If we look at the meaning of the name “Jerusalem” we shall see that it roughly translates as “abode of peace” which is an apt title for a heavenly place. It should then come as no surprise that in the ancient Egyptian Book of the Dead, (which is correctly called; The Book of Going Forth By Day) the name for the Egyptian heaven is called the fields of peace! As Gerald Massey also confirms in his book, Ancient Egypt the Light Of The World page 539. As was said before: these myths were attributed to celestial events and the movements in the skies, which were also the ancient's way of describing the stories about the soul's spiritual history and its evolution while down here on earth. This is the esoteric (inner) knowledge of spirit which, I would think, is highly likely that the sky was probably the first book used to explain such principles using the daily, monthly, and yearly course of natures symbols in the sky. 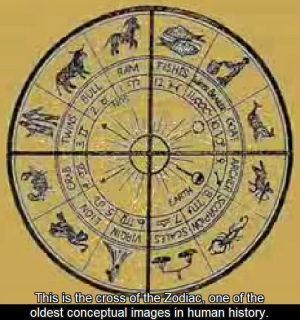 For example, the Zodiac chart is divided into four quarters that have three zodiac signs allocated to each quarter. These match the four cardinal points of the compass, the four seasons, and the four elements. As the Sun (which is the symbol for the divine soul) travels through these four quarters, it represents the spiritual journey of our divine soul passing through the four elements of earth, physical; water, emotional; air, mental; and fire, the spiritual. This is the fourfold nature of the human being that the divine soul partakes of, and thus crowns the lower elemental nature with spirit to form the microcosm. This fourfold nature is also applied to the year with the seasons of winter, autumn, spring and summer; and also to the day with morning, noon, evening and night. For example, when the Sun enters the west it goes down towards the realm of matter where it figuratively dies and traverses through the underworld around the northern quarter until the morning, when the Sun rises in the east, which symbolises the awakening of our divine nature. From there, it moves to the south where we feel its full force of spiritual power until it repeats the cycle again. It is this same spiritual theme that is naturally represented by the seasons of the year and which the ancient annual festivals celebrated with their myths. So how can we apply this methodology of thinking to our magical practices? One of the simplest ways and probably one of the most effective, if regularly practised, is by doing adorations to the Sun. Twice a day would suffice at morning and at night. By doing this we can form a link with our higher spiritual nature through the principle of "as above, so below." For it is not the actual Sun that we are praying too, but the spiritual principle of which it is a symbol of and which is also contained within ourselves. Once we have started to awaken the spiritual nature, then it becomes easier to see the "as above, so below" principle operating in our lives, and then we are able to partake in the fruits of our spiritual labour that we witness manifesting in our daily lives. If this becomes a regular continued practice, then we learn and gain skill in uniting the higher with the lower, the subjective with the objective, and therefore making it easier to bring about the unification of a peaceful spiritual state of being. It is within this state of mind where it becomes much easier to learn, grow, and develop in our magical practices and ideas; helping in forming a solid foundation from which one can work from. Any form of prayer or invocation that one favours can be used. For example the Oration of the Salamanders found in the Grimorium Verum. Or maybe you would prefer Crowley's Liber Resh vel Helios. I use the Aurum Solis Adoration rite because it is simple, direct, and easy to remember; and which I give below. O thou lone all-seeing eye of the vault celestial! but dim thy glory that I be not blinded. salutation and praise unto thee! Unless a piece of writing found on my blog is already attributed to another author or site, then please abide by the Plagiarism spell found below. for this will only incur my wrathful ill feel. I am a magician, an occultist, a father and a writer. I love most forms of magic, in particular, Solomonic grimoire magic, Hermetic magic, ancient Egyptian magic and Greek magic. I also have a keen interest in mythology, sacred writings and philosophy. 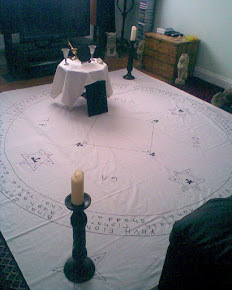 I use these subjects to enable me to practice, and understand the esoteric and occult significance of the magical arts. Blog banner - Since this is the first post, this is the first image.